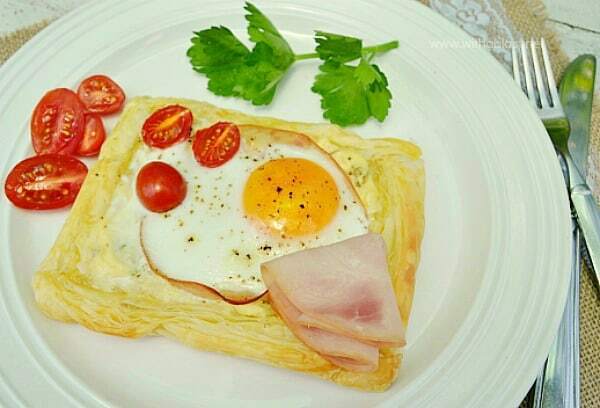 Looking for a breakfast idea for a special morning ? Valentines Day ? Then these Individual Breakfast Pastries are perfect. I have to say that the fresh Basil Creme Fraiche makes this dish a winner. So tasty and full of flavor ! 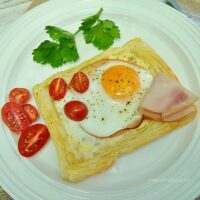 It also helps that the Egg does not turn the pastry into a soggy mess, even though the Egg is placed on top of a piece of Deli ham. 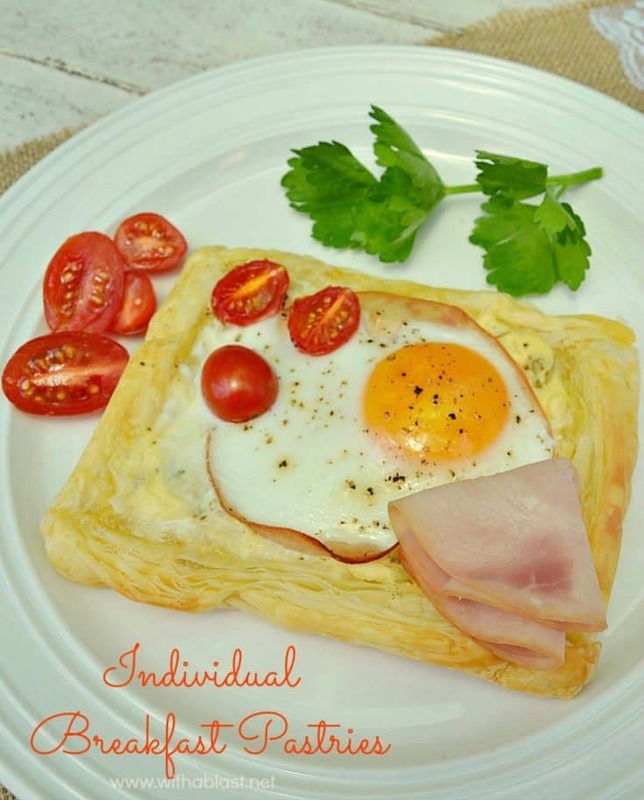 These individual Breakfast Pastries are so quick to put together (as long as you remember to defrost the puff pastry overnight!). All in all, it takes under 40 minutes, and you will still have time to get all the other breakfast goodies ready whilst the Breakfast Pastries are baking. By “all other goodies”, I do not mean a lot ! Maybe some freshly squeezed orange juice, fresh fruit and yogurt in a small bowl, and maybe you already have an idea of any extras ! You can add more Tomatoes to bake with the Pastries, or you can go half and half as I did with some baked, and some served fresh on the side. I know it is still a few months before Mother’s Day, but do you not think this would be perfect to surprise your Mom with ? I know my late Mom would have loved this, not as breakfast though, she was more of a bruncher, as I am, by the way. Well, whomever you decide on treating with these individual Breakfast Pastries, it is sure to be enjoyed by all, so go on ahead and surprise the whole family on Valentines morning. Serve immediately with an extra slice of Deli Ham and more fresh Cherry Tomatoes. That makes for a beautiful presentation… I think most mothers would be delighted to receive this. Sure beats the bowl of cereal! I love this savory breakfast pastry! It would be so satisfying. What a good idea 🙂 they look really tasty! What a fun idea! I'd like it if someone made this for me! I'm telling Sam I want this for my birthday breakfast! Think he'll make it for me??? These look easy and fun. They would make a great breakfast for a special day without a lot of labour.